The Spirit of Food provides 34 short essays on food, fasting, feasting, and faith. There a few "classic" essays, excerpts from Capon's Supper of the Lamb, Wendell Berry, Alexander Schmemman on the Eucharist, but most are new and grounded in memory of family and of church, that keep well from sentimentality. A large majority of the writers are women and the collection also contains a high percentage of more liturgical (Episcopalian, Lutheran, Orthodox, and Catholic) writers evoking more sacramental visions of our approach to food. Taking seriously our materiality and the connection food provides to God, they are consistently good and often miraculous. And most also end with recipes - the two that I have tried so far (not including the old Capon soup standards that have been staples for years) have been simple and excellent and will ensure my copy of the book will be getting a bit dirty. This is a wonderful collections of essays. I discovered several new authors to add to my to reading list. I particularly enjoyed the lack of pretension that makes its way into a lot of food writing today. The essays are short, interesting and heartfelt. Although primary Christian,the focus is on the sacred nature of food and how we share the experience. There is no heavy handedness only good writing and a love and respect for food and the earth. This is a thoughtful and sustaining collection of essays and recipes, a diverse portrait of the ways we nourish our families and ourselves. Read my complete review here. A lovely collection of beautiful essays. 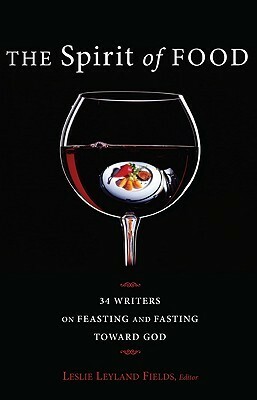 The Spirit of Food: 34 Writers on Feasting and Fasting Toward God (Cascade Books, 2010) is a wonderful collection of essays by an all-star cast of gifted writers on the connections between food and Christian faith. The book reminds me of one of those summer food festivals that feature samplings from all the best restaurants in town. I remember growing up with the annual Bite of Seattle. We would pay an entrance fee to get in and then tent by tent we would make our way around the festival stalls, gobbling up appetizer-sized portions of gourmet mu-shoo pork tacos and blackened salmon. In the same way The Spirit of Food invites the reader in to sample the gourmet writing of Lauren Winner, Wendell Berry, Ann Voskamp, Amy Frykholm, Alexander Schmemann, Robert Farrar Capon, and Leslie Leyland Fields who edited and coordinated this event/book. Interspersed among the more well-known authors are unique perspectives from dozens of others, all organized around the themes: On the Way to the Table, In the Kitchen, The Ways We Eat, Fasting, At the Table of the Lord, and Feasting. Given the nature of the book I'm going to approach this review like it's a conversation in the car with a friend driving home from one of those food festivals. Let's call it "Bite of the Kingdom." Friend: So how did you like The Spirit of Food/Bite of the Kingdom?Me: I don't think I've ever read so many tasty morsels of food writing. (yes, the puns are irresistable) Just when I was savoring the offerings in one chapter I was drawn to the next. They did a really good job representing different perspectives on how food intersects with faith. I like that each author was given the freedom to engage the topic from their experience. I could tell that the authors really enjoyed writing on the subject and that came through in the reading of the book.Friend: What was your favorite chapter?Me: I'm a sucker for Berry, Schmemann, and Capon but I'm familiar with their work so their chapters were like comfort food that is flawlessly prepared, and tasty as usual, but it's familiarity makes me look elsewhere for a favorite. I really enjoyed Amy Frykholm's treatment of Orthodox fasting rituals in which she writes about her experience as an exchange student in Russia where she "witnessed a fuller understanding of the body and soul in communion." I resonate with her desire for this kind communion. Suzanne Wolfe's description of her struggle with an eating disorder was wonderfully honest and served up just the right combination of the sweet hope of hunger satisfied and the sour despair of irreconcilable hungers. Friend: But which was your favorite.Me: Okay, if you're going to make me choose I'd have to say Lauren Winner's reflection on her experience with Kosher food laws as a Jew and the ways her experience with kashrut, as she calls it, might inform her foodways as a Christian. I was intrigued by her statement, "While Christians are not bound by the particularities of Deuteronominic dietary laws, we still may want to pay attention to the basic principle that underlies kashrut: God cares about our dietary choices." In summing up the provocative potential of Kosher food laws for Christians she says, "At its most basic level, keeping kosher requires you to be present to your food." She cites the "logic of kashrut" as she sketches the contours of a food ethic that includes paying attention and seasonal eating. She writes, "Food is part of God's creation. A right relationship with food points us toward him. "Her chapter really got me thinking about what other practices in the Bible and the history of the church might inform Christian approaches to food. It seems like an under-explored area in many church circles.Friend: Yeah I enjoyed her chapter too. It sure is hard to choose a favorite.Me: The only downside to The Spirit of Food is that you only get an small portion at each stop on the journey. Many of the chapters left me wanting a leisurely 10-course meal of reading to follow-up on the tantalizing appetizer. Friend: But it's nice that the authors provide a recipe to accompany each chapter. I bet you could make a nice 10-course meal from the recipes in the book. My only complaint is that their wasn't a beer garden.I think food may be the next big topic among American Christians and The Spirit of Food is the most accessible guide yet to the potential of food to shape Christian faith, and a convincing argument that it should. It would make a great Christmas present for your foodie friends. Even as I ask these questions, I know something is missing. Something our grandmothers and mothers knew at their church potlucks, as they carried to the communal tables Velveeta broccoli casseroles and Jell-O salads greener than any fruit dared to grow. In our zeal for purity and right living, we may have forgotten something other generations and cultures knew. That food is more than politics; food is more than economics; food is more than culture, entertainment, nutrition, even justice. As important as each of these is, none of them singly identifies or describes all that food is and does and is meant to be.Food is nothing less than sacrament. All food is given by God and is given as a means to sustain not just our bodies, but also our minds and our spirits. In all of its aspects--growth, harvest, preparation, and presentation--food is given as a primary means of drawing us into right relationship toward God, toward his creation and his people. Even its intentional absence, through fasting, pulls us toward a deeper dependence on God and one another.As I turn to the Scriptures now, I am amazed at the centrality of food in its pages ...From the introductionAs can often be the case with anthologies, even those for whom the essays are specifically written, one gets a mixed bag. Some of these 34 essays relating food to spiritual search were very moving and hit the mark for me. In particular, the introduction by the editor, the pig farmer's meditations, and the bread baker all had points that moved me and have come back to me frequently in daily life.Several of the pieces take Father Capon's seminal The Supper of the Lamb as a jumping off point. There is a key chapter of Capon's book included and you can see why it is probably his most reprinted excerpt. Indeed, if you haven't read his book, then save this one for later and read that first. Capon pulls off conveying how the world around us, beginning in our own kitchens, reflects God ... all the while also giving us a functional cookbook. In fact, it is on my Desert Island book list and I probably should read it once a year.If I could give half stars, this would probably be a 3-1/2 but I am going to give it the benefit of the doubt. Some of the essays struck me as covering very familiar food-writing ground in using their pieces as platforms for complaining, condescending, or posturing. However, these may very well strike others in a different way, especially since few of us are ever in the exact same place in our spiritual journeys, not to mention our levels of exposure to food writing.Each of the essays has a recipe at the end but, of course, finding new recipes is actually not the point, even if I did find a few I'm going to try out. It is to feed both body and soul that this collection exists and it does a good job. I just really loved this book. As noted in the title, 34 writers submitted an essay about food, and at the end of most chapters a recipe is included. I seriously just want to start inviting people over to dinner. It seems to me that eating has just become a task that we do. We feed our bodies in order to live, we feed our families because that's what we are supposed to do. But sharing a meal together is really a time of consecration. This book will make you slow down, and really consider what sharing a meal is about. It's about God, who provided this earth and all that grows in it to sustain our bodies. Because He's God, He doesn't just provide us with boring sustenance, of course not! Our God is a lavishly loving God, and He gives us choices that satisfy our hearts and our bodies. We can create lovely pasta dinners, enjoy that tomato right out of the garden, make delicious breads and choose from a variety of meat choices (if we are so inclined). I really appreciated that many of the authors pointed out, we need to start saying grace to God as soon as we start preparing our meals. We also need to thank and appreciate Him for the people who work so hard to provide those meals for us. We need to consider the choices we make when we buy our food. Are we buying food from people who are making responsible choices about the land and the animals that become the food on our table? Are we remembering that there are many people who do not have enough food to eat? Are we thankful when we eat, or are we just shoveling food into our mouths?I don't think there was an essay I didn't like, but one of my favorite essays was "A Way of Loving" by Stephan and Karen Baldwin. They share the story of how they created an Italian meal from scratch, and how their daughter's friends were disoriented to see a meal created that was not out of a box. Not only that, but these teens didn't even know how to set a table. This meal became a gift of love and a lesson in dining for these kids. Karen created a feast that included the little touches that dress up a table, like putting bread in a basket lined with a napkin. She endeavored to create a tone that said "this is a place to linger". I like that.I also enjoyed "The Communion of Saints" by Jeanne Murray Walker. She writes about her visits to her local farmer's market and how it became a place of healing, or sanctuary for her.This book is really about so much more than food. It's about creating communities of grace around our tables. In our fast paced society, this book will make you rethink food, and the companions that you share that food with. Last fall, I spent a quarter with a junior English class looking at (and sometimes eating) food. We talked about its various dimensions: aesthetic, nutritional, economic, ethical, spiritual. Toward the end of that quarter (too late, really, to benefit the class) I came upon this book while looking for readings on the spiritual dimensions of food. It provides a feast of enjoyable and meaningful reflections.Fields, who directs the writing program at Seattle Pacific University, draws many essays from writers connected to that program. Maybe that's why there's some unevenness in this collection. A few essays are in fact quite mundane, but there are also some fine pieces from the editor's local people. And while the current leading food gurus (Michael Pollan and Barbara Kingsolver) are missing, there are some major writers present, including Wendell Berry and Andre Dubus.The strengths of the collection are an abundance of rich, loving descriptions of food and food preparation, a candid inclusion of personal struggles and family sagas, and an avoidance of the obvious (in most essays) when it comes to the spirituality of food. The essays represent a variety of cultural and religious backgrounds and attitudes, and they avoid preaching.Worth the price of the book: "The Heavenly Onion," by Robert Farrar Capon, "The Communion of Saints," by Jeanne Murray Walker, "The Land that is Us," by Ann Voskamp, "Go Feed People," by Gary LeBlanc, "Things that Fall and Things that Stand," by Nancy Nordenson, and "Famine," by Thomas Maltman. Those are the ones that stood out the most for me over the months through which I spread out this reading, but they are not the only good essays in the book.Overall, this is a strong collection, and I recommend it to lovers of cooking and anyone in search of well-written essays. Increasingly, food is becoming a matter of law. And not simply by the governing authorities in what they tell us we should eat and not eat. But also within the church. The human heart within a person is not satisfied to simply make decisions about non-essentials (like food) for itself. It needs to call others to the same. Whther explicitly or simply by comparison. "I will not feed those foods - with all those chemicals - to my children. "How many believers have watched a documentary like Food, Inc. and then become so well-informed on the state of things to the point of then expecting others to react and believe the same way? We add a holy indignation to it. But the Bible makes it clear we are to reject nothing if we receive it with thanks.The NT gives a vision for seeing food with eyes of grace. But our hearts, which are not only always churning out idols are also making up laws...laws that are not there. And we are finding it acceptable to turn up our nose at food but at others because of the food they are eating.A book on faith and food that does not go after this line of thinking will naturally lean toward looking at food in terms of law. This work, while full of excellent writing does that. I loved some of the chapters and might even use some of the recipes but on the whole I was disappointed.Please, do not hear me wrong. I am happy for others to enjoy natural, farm fresh, free-range, local and organic food. I often enjoy it myself. But the Christian must be careful of legalism in regards to food - legalism which always stands waiting to be courted. I found these essays when I was looking for books on spiritual disciplines. I thought I needed something new for a class and it turned out that I found something new for me. It took awhile until it was the right time to read these and then I devoured them. (pun intended) I found the authors, their reasons for writing and their recipes fascinating. From the beginning where the writer is preserving wild fruits through the essay on hollandaise and another on hog mog to the last essay on baking bread, these were people I wanted to meet and topics I wanted to learn more about.I love to cook. I especially like to cook for others - hospitality is an integral part of who I am. So these essays could have been written just for me. For me, food is important to the way I express my faith. God gave us these good gifts and using them well is one way to serve God.I recommend this book to those who like food and would like to meet others who think seriously about eating and cooking. AMAZING BOOK! Before the end of the first "chapter" I was in love. I say "chapter" because it is a collection of stand alone essays or short stories. Often as a homemaker I feel discouraged; like I play a meanial or unimportant role. This book elevates eating, food preparation, gardening, baking, cooking, entertaining, hospitality, etc. to a whole new level. Great stories, so much Christian and Biblical perspective.Some other awesome part of this book is that it is such a fantastic resource! Each "chapter" ends with a recipe. And each "chapter" author gets a little intro bio that talks about their other publications and some of their favorite authors so I've got quite a few new "to-read" books to add to my never ending list. LOVED LOVED LOVED! Like any compilation, this one had delightful essays and others that left me nonplussed. It also had the unique feature of recipes at the end of every essay—-some I'm dying to try and others at which I didn't look twice. This anthology's thoughtful lines and lovely stories provided a helpful balance to the “sinful eating issues” books I've read, helping present a positive picture of how eating and drinking can point to and glorify God. Loved the format - an essay and a recipe from each author - somehow tied to God as Provider, or Jesus as the Bread of Life. Parts are over the top green and would ban us all from ever stepping into a grocery store. but I can appreciate people who enjoy growing things and feeding their families well. This anthology is quite thought provoking. Each essay very different and searching. I liked some of the essays better than others, but that is the joy of an anthology! Just skip one if you aren't taken by it and get on to a different one. Really interesting book on the relationship between food and a spiritual relationship with God. Loved the essay about how to cut an onion -- now I think of it every single time I chop one. I'd say that's a sign of good writing! Preparing home grown food is almost a holy thing. Gathering together, the uncrushed pace, enjoying each other's company. It all goes together for the end...peace.I came away with new thoughts on making food, eating and hospitality. Refreshing book! I loved some of the insights in this book and argued in my head with others, but a whole book about food and the spiritual life was an overall treat for me! I'm glad I own it to reread parts from time to time, and there are some yummy looking recipes to try as a side benefit. Must read for any foodie who follows a passionate Rabbi. Hands down, one of 3 favorite books from 2013. An amazing compilation of essays which help us to understand there's more to food than calories. Some really good essays. Astounding, challenging, painful, delicious, upbuilding. I loved this book. Food has a lot to do with the spiritual life, and the authors bring this out in their essays. A book to make you think....and recipes to make you eat! Interesting concept, good book. I'd give it a 3.5 and recommend it to anyone interested in spirituality and food. A few of the essays were incredible, a few were terrible, most were pretty good.